Guided tours are both entertaining & educational and offer demonstrations of traditional farming activities such as turf cutting, sheep herding, soda bread making on the open fire and other activities & games. The centre is based around the restored pre-famine cottage of Dan O'Hara who was forced to emigrate in the 1840's when he was evicted from his home. Guided tours are both entertaining & educational and offer demonstrations of traditional farming activities such as turf cutting, sheep herding, soda bread making on the open fire and other activities & games. The audio visual introduces Dan O' Hara's Story & the history of the area. The history & artefacts room has articles and displays on Connemara through the Ages and many items of historical and cultural interest. 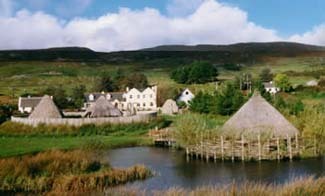 Other items of interest at the Centre include reconstructions of a crannog, ringfort & clochaun. Open daily April - October 10am-6pm, last admission 5pm.